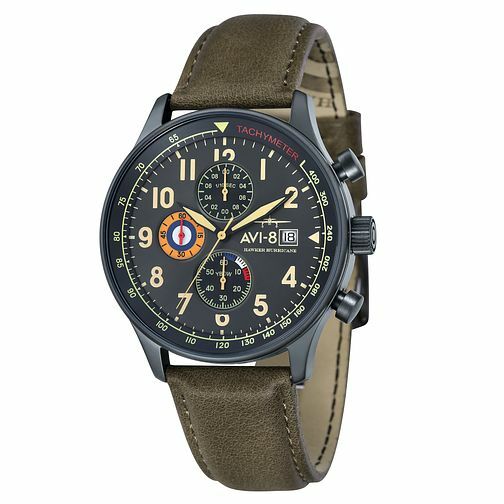 AVI-8 Men's Hawker Hurricane Green Leather Strap Watch is rated 4.0 out of 5 by 1. Rated 4 out of 5 by Anonymous from A Lovely Watch for a good price This watch looks and feels good. From the beautifuly crafted box to the lovely soft leather strap, everything is great. The only issue (if I'm being picky) is it's weight. I like a heavier watch but it's only a minor gripe. I was spoilt for choice with all the styles and colours so enjoy picking. PS I've had a few people mention the watch when they've noticed it on my wrist.